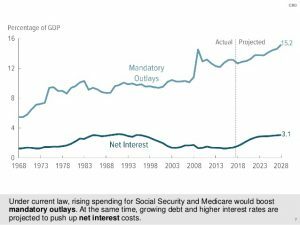 WILL CONGRESS CUT MEDICARE, MEDICAID AND SOCIAL SECURITY? The Congressional Budget Office projects that recent tax cut legislation and spending packages will increase the federal deficit by $139 billion, raising it to $804 billion in 2018. In December Congress passed a 1.5 trillion tax-cut package and early in 2018 approved a $400 billion budget. 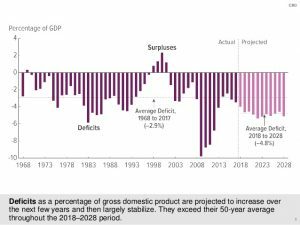 The CBO projects the US will return to a trillion dollar deficit by next year. Last week Congress submitted a plan to make up the difference with cuts to Medicare, Medicaid and Social Security. The above slides were obtained by the Congressional Budget Office. You can find these slides and more on their website. Last Tuesday, House Republicans released a budget plan that would make large cuts to Medicare. The budget plan intends to privatize Medicare ; thereby hoping to eliminate $537 billion out of the program over the next decade. Congress argues that privatization of Medicare will bring down costs. Seniors eligible for Medicare would receive a voucher rather than a Medicare card. The voucher would be used to purchase private health care plans. Private plans could be more expensive – leaving seniors to either foot the extra bill or change to plans that provided less care or limited the available providers. Either way, the cost-shifting is born by the seniors. Tagged: "cuts to Medicaid", "cuts to Medicare", "deficit" and cuts to Social Security"